What Lexie Loves: Film Review: Paddington 2 - Better Than The Original?! Film Review: Paddington 2 - Better Than The Original?! Hola Lexicans! So on the weekend, my family and I went to one of our local cinemas (or I think as my American readers call it - the theaters (I don't know, do you call them that?!!) to watch a new movie release on Paddington 2, the sequel to Paddington*. I really enjoyed the original and for quite a while it was my favourite film ever, so whilst I know I'm not the target audience anymore I was still very excited to go see it. And I did really enjoy it, so I thought I would share with you a spoiler-free, review on Paddington 2. I'm sure all of you have either a) seen Paddington 1, b) read the book or c) just know what it's about (ahah feel like a quizmaster), but just in case I thought I'd share with you a basic summary on what it's all about. Paddington stars a young bear (called Paddington!) who is sent to London to try and make a life, there he gets taken in by the Brown family and gets up to lots of mischief, which could lead to danger. In the sequel, Paddington is on the hunt for the perfect birthday present to send to his Aunt Lucy, who is back in Peru when he comes across a pop-up of London. He identifies it as being the perfect gift, but what he doesn't realise is that it contains the secrets of how to find a huge treasure chest, meaning that someone also has their eye on the book. Then one night, Paddington spots someone breaking in and stealing the book, but he is arrested as the culprit and ends up getting sent to jail! 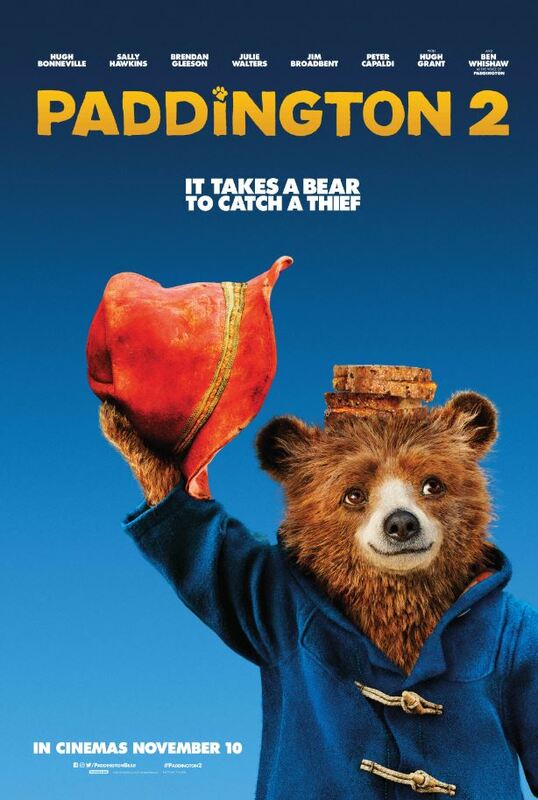 Simply put the film tells the story of Paddington and the Browns trying to defeat the 'baddie', clear Paddington's name and is all about kindness. So firstly, yes I know the plot sounds like such a cliché, ordinary children's film but actually what makes it so good are all the smaller things. Firstly, the film is really funny! The jokes aren't too cheesy or childish so adults and teenagers would find them funny, but they're still easy to understand so they appeal to kids as well. And then on the other side of the spectrum, this films gets in parts unexpectedly sweet and heart-warming. I think most kids films have a "message" to them these days, but actually this one is particularly touching and has a really nice ending. SO, it's definitely one that is great for any member of the family - young children, tweens, teens and adults and I would recommend it to anyone who wants a really lovely film to watch this winter. Overall I really enjoyed Paddington 2 and would whole-heartedly recommend it to families who want a nice, comforting watch that still has action and comedy when its cold this winter. Haha Americans say movie theater. :) Awesome review!